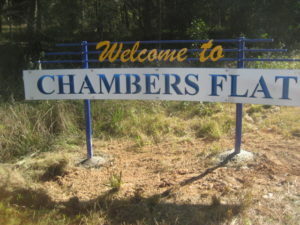 Welcome sign to Chambers Flat. 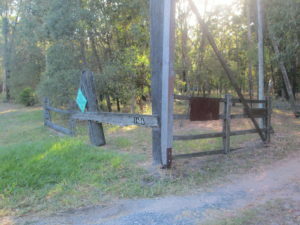 Entry into our property of five acres of land is past two very big upright posts and an old timber cattle gate I retrieved for nothing when they closed the Cannon Hill Cattle Yards in the early 1980’s. 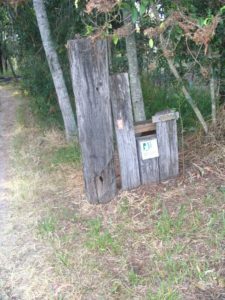 The letterbox is built out of an upended old timber railway sleeper ….. it has a big sheet metal letterbox that was built for an old landscape job I was constructing in 1979. The client rejected it as she didn’t find it satisfactory for her suburban site. I reused it on our site and has been in good use on our site for 28 years up to 2017. The initial entry leads down our earth driveway to our house. We live in a special house built largely of demolition timber and stone, built thirty six years ago in 1981 for a fraction of the cost of a new house. Some of the stone is very old from the late 1800’s. Australia as a whole was only settled after 1788. Compared other countries, the 1800’s is very old to us. 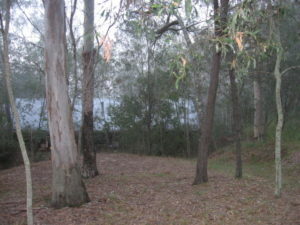 The house is on five acres of light open Australian bush which we bought very cheaply when we came out to our bush block in 1977 ….. four years earlier. We were way out thirty five kms. 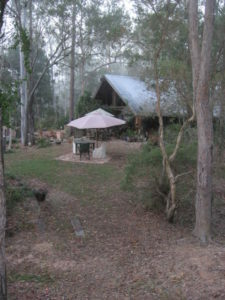 south of Brisbane then in the countryside. Now we are in the middle of everything …. not that we want to sell. Acreage land has become very valuable around us now. We initially came here to Chambers Flat in 1977 after spending the first two years of our married life in a small rented cottage at Taringa, one of the suburbs of Brisbane for $A25.00 / week from some older friends. In those days, the area was still very much bush. 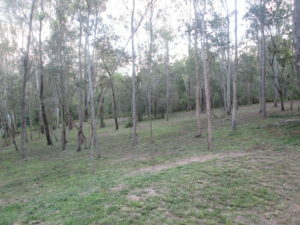 We came to this bush block where wallabies grazed on the side of the road down around the corner. 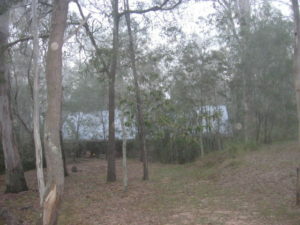 Across the road, was a 100 acres of bush with no houses whatsoever. Trees crowded and overhung the narrow road which had been an early stock-route from Beaudesert to Waterford / Beenleigh in the late 1800’s. You could then buy 5-10 acres of land for about $10,000-$15,000.00. Right from the beginning, I had a dream to build a house that seemed as though it had grown up from the ground. We had an architect friend draw some initial plans. With more discussion, the plans were changed to accommodate demolition stone, beams and bricks which had been recently been acquired. The idea was to create a total concept where bush, house and garden flowed together. The architect submitted the plans to the Beaudesert Shire Council enabling us to live on the block whilst the house was being built. A builder was eventually contracted in 1981 to build the plans for $32,000.00, about 1/3 the price at the time with using demolition materials. 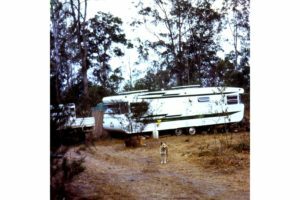 In 1977, we came out to live in a 27 foot caravan and annexe in the hot dry bush in the middle of a December drought. The van was like a sauna during the day. We had no power, water or telephone. The power was several kilometres down the road. With water, I was fortunate to have small Toyota utility where I could take a clean washed 44 gallon petrol drum on the back and go down 5 km. to the overhead public tanker tap and fill the drum. I would drive home and siphon out the water into the caravan tank. This enabled us to use the water in cooking and washing up. Candles were all we had for lighting. We were fortunate to have friends across the creek in a small house. It was a welcome break to go over for a shower every night, a bit of black and white TV and social contact. We bought this caravan for $3,000.000 in 1977 then we sold it for $3,000.000 in 1981 when we built the house. So we had free rent for four years on our land. Unknowingly, I had always had an artistic, innovative creative side from my farming background. I could pictorially visualise things in detail long before they were constructed. That I understand is a special gift in life. 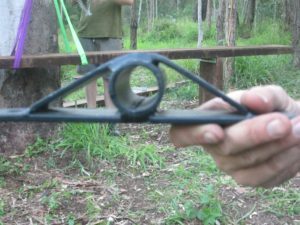 I had grown up in the rainforest country of Wilson’s Creek, up in the mountains out from Mullumbimby, Northern New South Wales. This meant I had developed a special affinity to nature and the natural environment. My father had taught me by example, how to make things from the bare minimum of scrap, to turn unwanted scraps into useful items He had come through the Depression days of the 1930’s. This was recycling things long before recycling was a fashionable term. I had put this knowledge into good effect in the building of the future house. 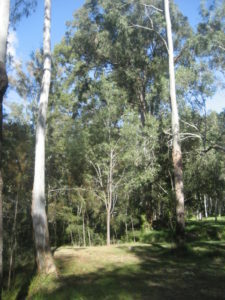 Our property of five acres has many eucalypt trees on it with some areas of open space. See the photos below. 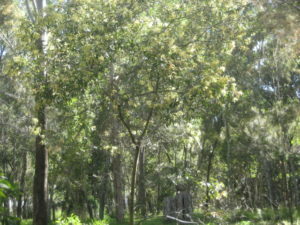 Acacia trees in flower in September which is the start of Spring in Australia. 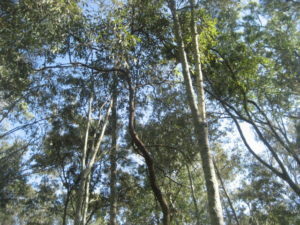 Among the many eucalypt trees there is a small banksia tree …. 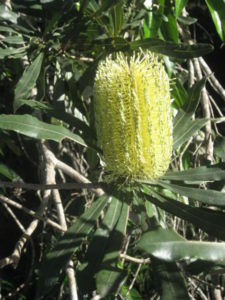 Banksia integrifolia. 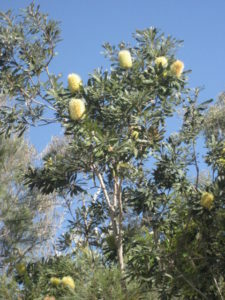 This normally is a coastal banksia on the sand dunes on the sea. 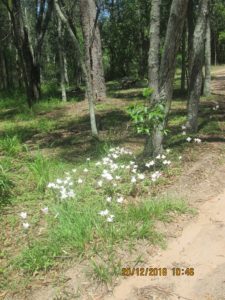 However, it grows very well on our land as we have very sandy soil. Our land is on a sandstone base four metres down below the soil surface. We have on our land about a metre of black sandy topsoil which becomes a heavy clay layer which then goes down to the sandstone base. With heavy rain, the water sinks down to the heavy clay layer and sits on top of the clay. 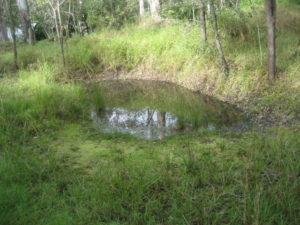 It is like a vast underground dam and with slight southern slope of the land, this underground water slowly drains down the slope over several months. Three months later, this water is readily available at the surface if you dig a hole. Woe to you if you went down in a vehicle. 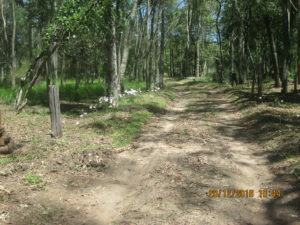 The soil would turn to instant bog and you would need to be towed out by another vehicle on a firm surface (that is why we had many horizontal logs and branches laid down in our extensive driveway coming down to our house). When the heavy clay layer is broken into, this underground water trickles out and down to fill any depression in the clay base below. It then becomes free water with an extensive surface. This is why we have some big ponds around our house. 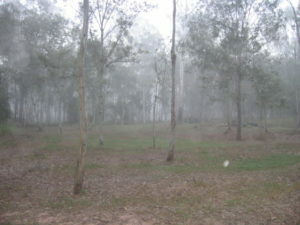 I planted three trees around the property in the late 1980’s. 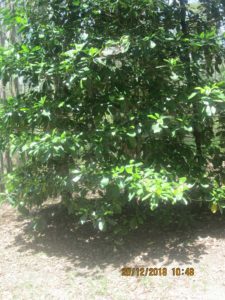 These were the small native rainforest tree, the Native Gardenia called Randia Fitzalanii …. 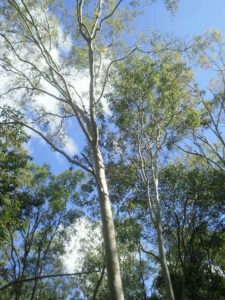 see the many images of the tree. 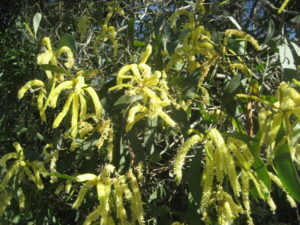 It grows as a woody shrub or small tree some 3–10 m (9.8–32.8 ft) in height. 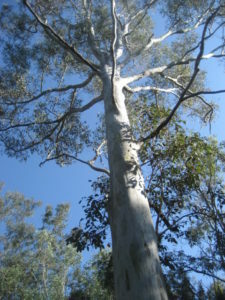 The trunk is covered by smooth grey bark. The large glossy dark green leaves are obovate to oval-shaped and range from 10–18 cm (3.9–7.1 in) long by 3–5 cm (1.2–2.0 in) wide. The yellowish veins and midrib are prominent on the leaf. The new growth is a bright lime green in colour. The small (2-2.5 cm or 1 inch) white fragrant flowers appear from September to November, occur singly and have five lanceolate petals around a tube. The round- or oval-shaped fruit is 3–4 cm. in diameter and ripens in April to June. The fragrance of the flowers resembles that of the common gardenia, and fruit can be eaten fresh. I had an interesting experience earlier this year in 2016 (now September 2016). 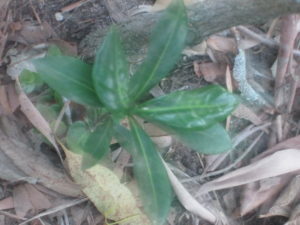 I wanted to grow from natural seed, Randia Fitzalanii …. see the Post 4: The Rainforest Garden Room. 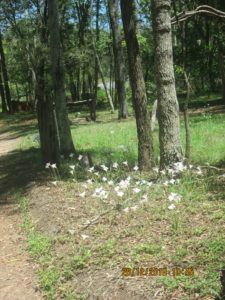 I wanted to grow quite a few (100 +) to plant around our boundaries of our property …. at the front along Chambers Flat Rd. and down our two side boundaries. Randia is an excellent screening tree because of the density of the tree. Earlier in the year, I retrieved several of the small yellow pear shaped fruit. I extracted the small seeds and placed them in several big pots of the soil mix created from our own compost and sandy soil mix. Being placed in our nursery watering area, up came many Randia seedlings. These were then taken out and planted out in small 150 mm nursery pots. These then grew to 150 mm high. Recently, at an appropriate time after a good rainy period, these were all planted along the front along Chambers Flat Rd. and down our two side boundaries. These will then grow into a continuous screen along Chambers Flat Rd. and down our two side boundaries. When we bought the property in 1977, foliage was quite thick but twenty nine years on, the foliage has really thinned out. You are beginning the see the house down among the trees. Car lights are being seen as they drive along Chambers Flat Rd. at night. As the Randia begin to grow over the next few years, they will begin to form an excellent screen as they have been planted about five meters apart. That means you not see our house down among the trees and the two houses next door will not be seen as well. 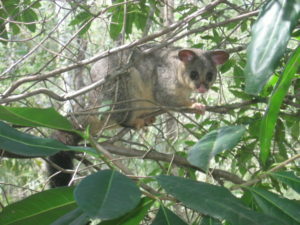 … Possum in the branches of a low growing rainforest tree in the middle of the day …. 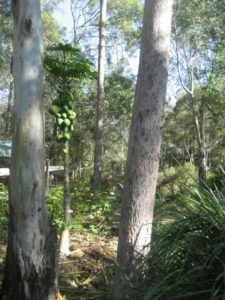 instead of night when they come out …… I had planted this rainforest tree on the edge of our garden a few years ago …..
…. 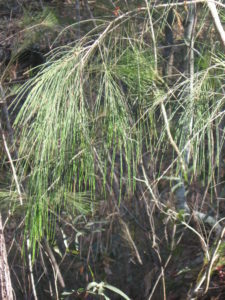 Casuarina littoralis or Black Oak is a small narrow tree between 6m and 15m high; bark persistent, rough, hard, dark grey/dark brown. Foliage is needle like and branchlets are generally upright, the photosynthetic branchlets have a tiny reduced whorled teeth leaves 6 to 8 per segment. 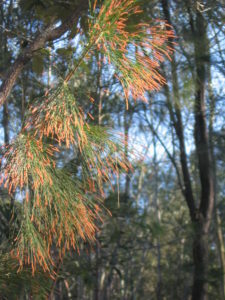 Flowering occurs in autumn through winter, male trees turn gold when laden with pollen. 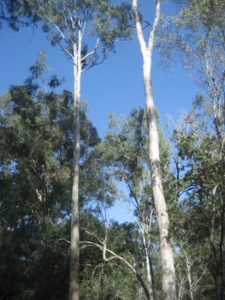 Female trees only bear the “cone” like fruit after small bright red flowers. 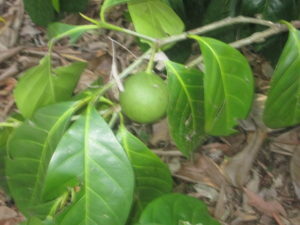 The fruit are 10 to 30mm in length and flat topped. 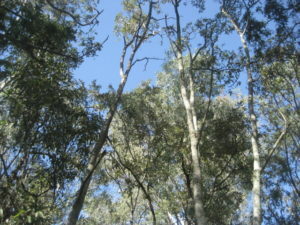 May form dense stands in the absence of fire in bushland areas. We have many of these small trees on our land. Since September 2015 we have put down a bore to 36 metres and struck abundant drinkable water. With a branching irrigation pipe, bore water can now be brought to taps on the topside and bottom side of our house. Sprinkling can be left on different areas for several hours at a time for minimal cost. Having abundant water for our garden, has greatly changed how we do gardening. 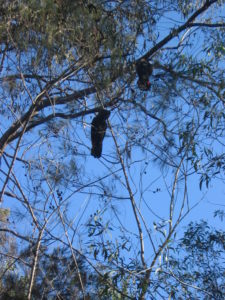 Red-tailed black cockatoo among the gum trees ….. The red-tailed black cockatoo also known as Banksian- or Banks’ black cockatoo, is a large black cockatoo native to Australia. Adult males have a characteristic pair of bright red panels on the tail that gives the species its name. Read more on this website …. 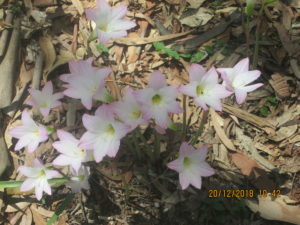 When we built the house in 1981, I suddenly found these pink flowered lilies in a clump under some small trees coming down our extensive driveway. See the second top photograph below to see them in full flower after the rain in December. The lily bulbs are very easy to transplant into another location. Fog among our Trees on a Winters Morning …. Up the top of our land is a small dam. We had a major problem with our long entry driveway down to our house from 1977 to the late 1980’s. Our land is on a sandstone base four metres down below the soil surface. We have on our land about a metre of black sandy topsoil which becomes a heavy clay layer which then goes down to the sandstone base. With heavy rain, the water sinks down to the heavy clay layer and sits on top of the clay. 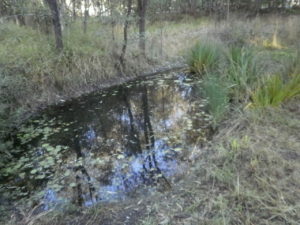 It is like a vast underground dam and with slight southern slope of the land, this underground water slowly drains down the slope over several months. Three months later, this water is readily available at the surface if you dig a hole. Woe to you if you went down in a vehicle. The soil would turn to instant bog and you would need to be towed out by another vehicle on a firm surface. In the late 1980’s I was in close contact with a landscape supplier through my landscape design and construction business I ran. This supplier said that he didn’t have a reliable source of sandy topsoil. I commented that our acreage land was on sandstone and we had metre of sandy topsoil all over the top section. I arranged for him to come out and get as much as he wanted with his low loader. 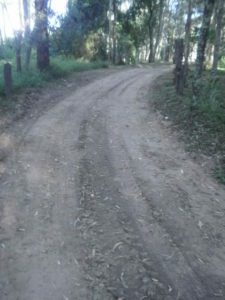 Instead of paying me for the number of cubic metres of soil, he could take it out in hours of machine work on our driveway …. a fair trade !! He went further than I had anticipated. He dug out our driveway for about a 100 metres by taking out the topsoil to 300 mm deep. Then I laid many horizontal logs and branches in our extensive driveway coming down towards our house. Then he refilled the excavated topsoil area (placing the soil fill over the many horizontal logs and branches) with sandy clay excavated from the area he had been taking sandy topsoil from. This gave us a free shallow dam after he had left the site. This gave us occasionally a water-filled dam as per the photos below. The real benefit is that driveway was made totally solid with a very firm under base. Our driveway problem of potentially breaking through the sandy topsoil crust after heavy rain was totally solved. If we had broken through, we would be really bogged in a liquid mud. As of 2015, we do not need any water from the dam for our garden as we now have a good bore. Since September 2015 we have put down a bore to 36 metres and struck abundant drinkable water. 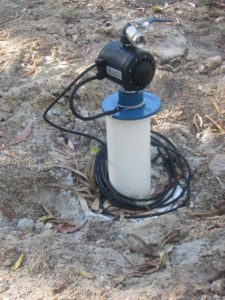 With a branching irrigation pipe, bore water can now be brought to taps on the topside and bottom side of our house. Sprinkling can be left on different areas for several hours at a time for minimal cost. 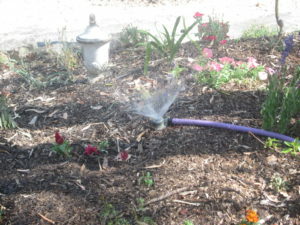 Having abundant water for our garden, has greatly changed how we do gardening. Building the Car Shed in April 2008 …. 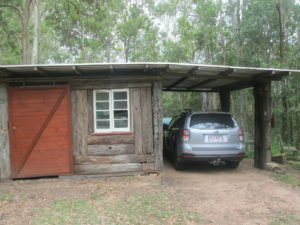 This was a temporary garage up until seven years ago in 2008 … It was a big tarp draped over a timber frame. It was bit primitive but it kept birds from messing on the car or sticks falling off nearby trees and falling on the car. There was a temporary bulk storage at the back. About that time, our Landscape Design and Construction firm was a member of Bartercard. I had another member with a small excavator and hole-digging screw come to dig out eight deep holes for the placement of very big upright vertical posts for building on a permanent car shed. 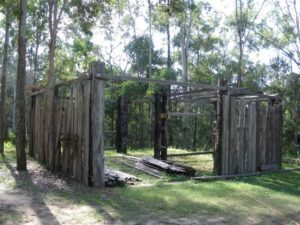 These were very big and had been stored at the top of the land for many years from a very old building that had been demolished in Brisbane. I was good friend of a demolisher called Neil so I was always contradealling favours on old timbers. Harriet (my wife) and I …. we love history and art. This explains why we built a house out of recycled timber and stone: THE HOUSE. I had marked out the shape of car shed in white lime on a flat area in the car park below the house so you could see it clearly. The small excavator dug out the marked holes for the car shed using a hole-digging screw. 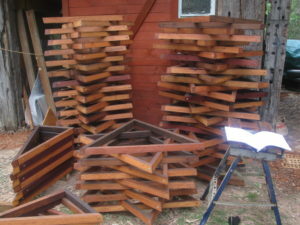 The operator then towed down the selected big square shaped beams from my collection stored at the top of the land. He then carefully lifted these big beams and lowered them into the big holes about 2.00 meters deep. I then shoveled the dugout soil into the hole bit by bit and rammed it with a crowbar head over the next few weeks. 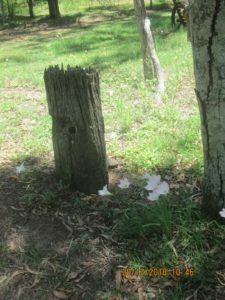 The posts were kept vertical. In later weeks, the excavator operator man came as part of his Barter Card work with two ladders, a plank to go between them and a chainsaw. He cut the big upright vertical posts at roof height, then he left. This meant I could cut and fasten with big coach screws, horizontal timber boards around the car shed for future wall boarding. Years before I had arranged the pulling down and transportation of a very old settlers barn from Logan Reserve, an area near us. 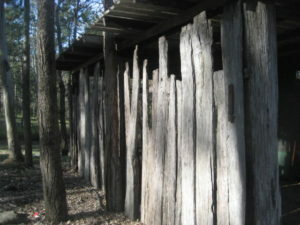 This old settlers barn was built of many big split slabs. To obtain these slabs is a very rare thing. 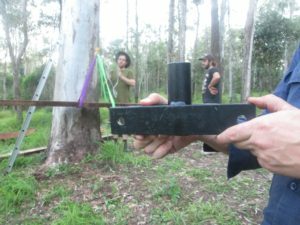 When settlers came out in the late 1880’s into the dry Australian bush, they wanted to clear the land of trees and create open space for their cattle. 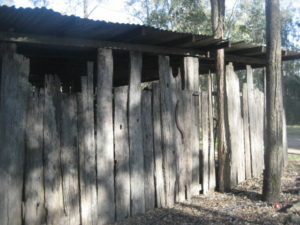 They split the trees with wedges to form timber slabs for a hut on their land. They also made post and rail fences, horizontal rails and bigger posts to go in the ground. I had stored these slabs for many years up one side our property where I had stored many pieces of demolition timber left over from the house when we built it it in 1981. 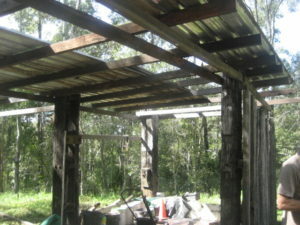 I carefully sorted these slabs out, wheeled them down 100 meters to the car shed and began standing them vertically on a brick base to fill in the sides of the shed, drilling in big coach screws to hold them to the horizontal timber boards. 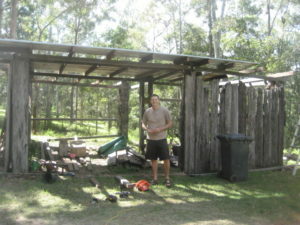 About year later, after the shed structure had been built, my brother Rick came to help build the roof. It was going to be my 60th Birthday next week and a lot of people were coming at night for a big party. We wanted to build the shed and properly house the car. 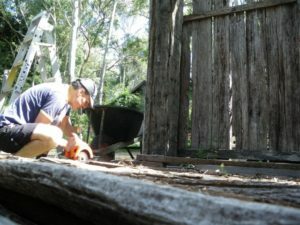 Below are photos of my brother Rick building the roof. 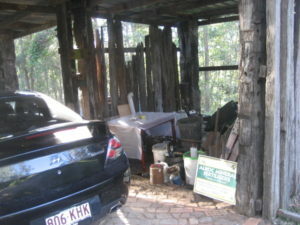 We had a weather proof storage space and I brick paved the carport side for the car. In July 2015, our 34 year old son Anthony has come to live with us again after ten years of being away. He acts as a tour manager for firms who engage him. These firms sign him up because they are bringing in international music bands into Australia. He has to work out all the tour details for each band. He is very detailed, practical and organising …. he loves it!! He takes after his mother Harriet. We all went to Melbourne in July 2015 to attend the funeral of Harriet’s mother Heather Kent. Heather was 97 years old and the funeral was packed out. There were even people there who Heather wouldn’t have seen for 20 years. Heather was a real family and friendship woman. Anthony was one of the pallbearers along with the grandsons. Anthony suddenly experienced the value of family. That is why Anthony has come to live with us again after ten years of being away. He has become very family orientated and wants to look after us in our later years. He has come to love and appreciate our house built from recycled materials. He has come to help build ‘The Aitken Legacy’ long term. 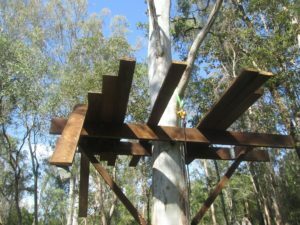 He has become very focused on tree houses and has a big tree down the back of our bush block land where he is has built his tree house. He has formed a Treehouse Club on Facebook. He has about 347 members already from around the world. See the photos of completed tree houses from around the world. In November 2015, he flew over to Oregon, USA to meet Michael Garnier who has a whole business in building tree houses. He came back with a whole suitcase of special hinged bolts that he can use on a tree without hacking into the tree. He was getting very serious. As I said before in a previous post, I had run my own business in Landscape Design and Construction for twenty years, doing very creative individual designer gardens for wealthy residential clients. I was more an artist than businessman. I thought of a landscape as would a sculptor in a solid medium, but I saw it as a three-dimensional piece of space which people walked through. This space changed with time as it grew and changed with the time of day: shadows vs. sun patterns, boulders, colour, plants, trees, earth-forms, solid structures and water. These were the ingredients I used. Unknowingly, I was a landscape sculptor. Rather an intangible product to sell and run a business with!! However, I built a structure for my life: my marriage, family and business from this base. 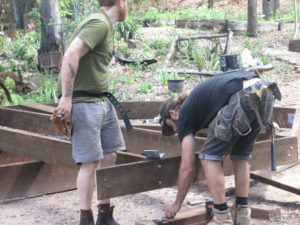 Anthony has building many things around our house, like the raised garden beds in the Permaculture section of our extensive garden. 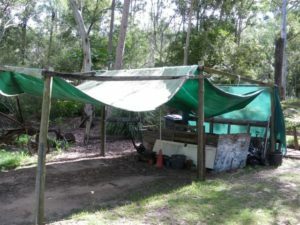 See the Post 7: Permaculture Garden Room. Then he he started building on the car shed. He said to us he would like build a man cave where we had parked the car ….. could we park the car on the other side? A man cave is where he & I can build things together. Then Harriet waded in ….. she wanted a place to do some art. It has now become an art house …. no gender is apparent. He built over a several week period an entire new facade on a light pine framework that incorporated an old recycled window. Then he filled in the wall with some of the split slabs in a horizontal position and some in vertical position …. very artistic. 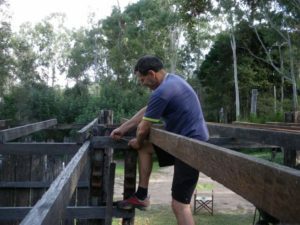 He then built a big barn door, hung on a horizontal steel rail off an old wheeled banana carrier I had since my banana growing days at Wilsons Creek in the 1950’s and 1960’s. Harriet and I am very proud of what our son has accomplished. Then I moved into a downstairs office so my growing son could turn the office into a bedroom for himself and to build an office for himself in the first room immediately above the staircase. He began running his own business. See the post: A life changing situation for my fuller story. In the last few months, our 34 year old son Anthony has come to live with us again after ten years of being away. He acts as a tour manager for firms who engage him. These firms sign him up because they are bringing in international music bands into Australia. He has to work out all the tour details for each band. He is very detailed, practical and organising …. he loves it!! He takes after his mother Harriet. We all went to Melbourne in July last year (2015) to attend the funeral of Harriet’s mother Heather Kent. Heather was 97 years old and the funeral was packed out. There were even people there who Heather wouldn’t have seen for 20 years. Heather was real family and friendship woman. Anthony suddenly experienced the value of family. That is why Anthony has come to live with us again after ten years of being away. He has become very family orientated and wants to look after us in our later years. He has come to love and appreciate our house built from recycled materials. He has come to help build ‘The Aitken Legacy’ long term. He is now full of new ideas. He is far stronger than I am and wants to build new things eg. 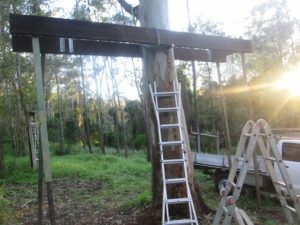 He has become very focused on tree houses and has a big tree down the back of our bush block land where he is has built his tree house. He has formed a Treehouse Club on Facebook. He has about 347 members already from around the world. 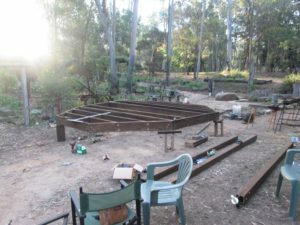 See the first photo to see his completed tree house and the next few ones on showing the building process. 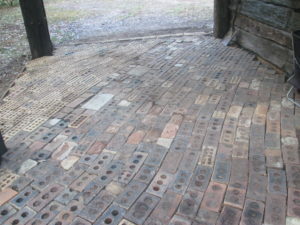 I have just completed on the 02.03.17 the paving in the car shed. 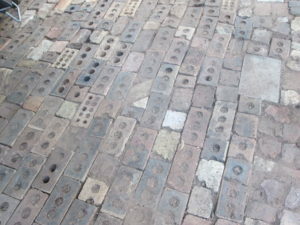 I obtained these bricks free of cost from when my next door neighbours house had been built 40 ++ years ago. I like to curve my paving which gives an organic feel. Very little in nature consists of straight lines. It only in the crystalline world where crystals form the structural component in rocks ….. the foundation of the Earth. The side wall built with many big split slabs. 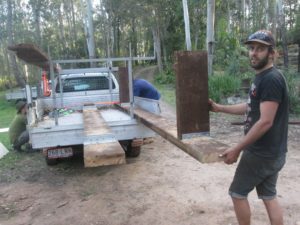 ANTHONY, OUR SON, BUILDING HIS TREE HOUSE ON OUR LAND ….. September 2016 …. Initial stage …. 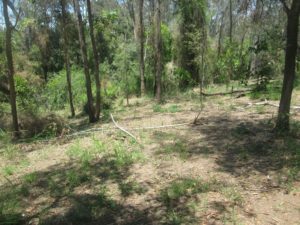 September 2016: The tree Anthony is building his tree house around and area he has cleared around the tree …. Our 34 year old son Anthony has come to live with us again after ten years of being away. He acts as a tour manager for firms who engage him. These firms sign him up because they are bringing in international music bands into Australia. He has to work out all the tour details for each band. He is very detailed, practical and organising …. he loves it!! He takes after his mother Harriet. We all went to Melbourne in July last year to attend the funeral of Harriet’s mother Heather Kent. Heather was 97 years old and the funeral was packed out. There were even people there who Heather wouldn’t have seen for 20 years. Heather was a real family woman. Anthony suddenly experienced the value of family. Anthony was also one of the pall bearers. That is why Anthony has come to live with us again after ten years of being away. He has become very family orientated and wants to look after us in our later years. He has come to love and appreciate our house built from recycled materials. He has come to help build ‘The Aitken Legacy’ long-term. He has become very focused on tree houses and has selected a large tree down the back of our bush block land. 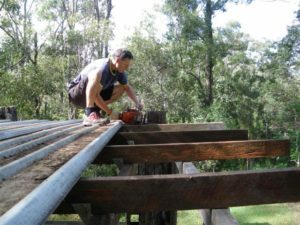 He has already built the initial platform 4.5 metres off the ground. The dome is still being built as of June 2017. He has formed a Treehouse Club on Facebook. He has about 350 members already. In November in 2015, he flew over to Oregon, USA to meet Michael Garnier who has a whole business in building tree houses. He came back with a whole suitcase of special hinged bolts that you can use on a tree without hacking into the tree. He getting really serious. Early one morning I heard a big truck coming down the exit of our acreage driveway. I went out to see what was happening and it was a large crane truck with a big load of new timber beams. I didn’t know anything about this until the driver filled me in ….. the load was for my son Anthony. 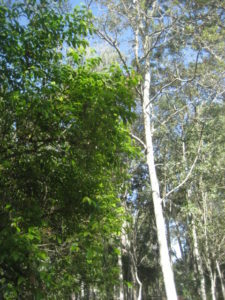 However, he couldn’t fit around a slight bend which had a solid eucalypt tree right on the edge. I suggested he back back 100 metres right back to the entry road and come down our entry. 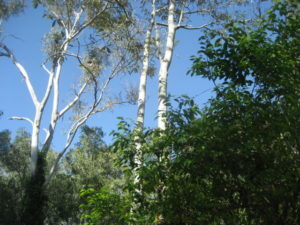 He said he looked at that but saw there many eucalypt trees down the driveway and so decided to come down our straight forward exit driveway. I assured him that we often had trucks come down there. We are on tank water and needed a big water truck to come down and top up our tank about five times a year in between low rainfall. That has all changed since September 2015 with our new bore supplying much drinkable bore water. 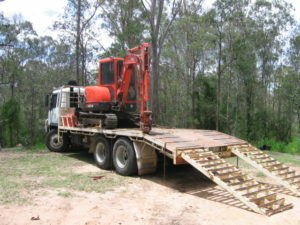 He backed the 100 metres up the driveway to our entry road and easily came down our front section of our driveway and unloaded all the heavy timbers to side of the big parking area. 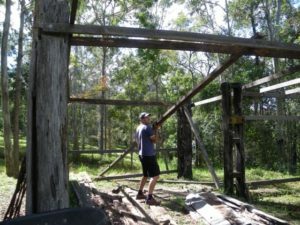 How was Anthony to build his tree house and get all these timbers 300 metres down to his site? The few photos shows how he did it. The next day Anthony solidly went to work ….. see the photos below. 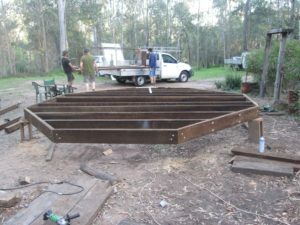 Anthony and his contract carpenter Pat started building the tree house platform up in the parking area of our house …. 300 metres up from his tree house location . .. 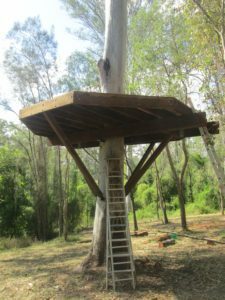 The tree house platform was assembled on concrete blocks to aid in the future disassembly of the platform. Then the pieces were systematically unscrewed and placed on Anthony’s utility. 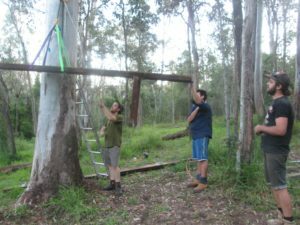 The next step was that the two main beams were taken down to the tree house location and lifted into position by a block and tackle ….. 4.50 metres off the ground. 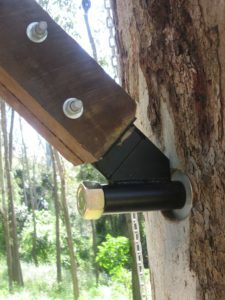 Using a ladder, he used two of Michael Garnier’s hinged bolts to fasten them to the tree. 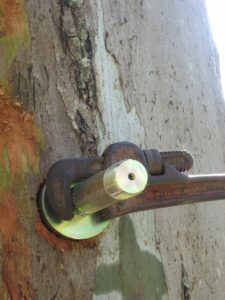 Each bolt had a movable flange you could bolt to the beam. Four sturdy cross braces were then installed using further bolts. See the photos above and below. Four sturdy cross braces were then installed using further bolts. He has installed bearers and outside framework to support the floor of marine ply. The floor of marine ply has been installed and cut to fit the octagonal floor shape. He has painted the floor a tan colour which blends into the surrounding landscape. Anthony has started to build a rounded dome built out of triangles of wood in our car-park in April 2017. He calls it a Geodesic Dome. From Anthony: It was a pretty crazy idea to put shingles on a geodesic dome. But I’m liking where this is heading. I love working with Json Mung. He likes my lil bits of crazy and makes it work in reality. He was on the scaffolding today, while I was on the cutting station. He would mark the shingles out, throw them to me, while I cut the pattern. I’d throw them back up to him. In the meantime Jase would pre-drill and hammer while I prepared future shingles and played DJ. Waterproofing done. / A long time ago, in a galaxy far, far away. It is a period of civil war. Rebel spaceships, striking from a hidden base, have won their first victory against the evil Galactic Empire. From Anthony: My mate Shamgar doesn’t do things by halves. I was trying to convince him to WorkSafe but he just laughed at me. He can balance on one leg and polyurethane a crack like a ballerina. 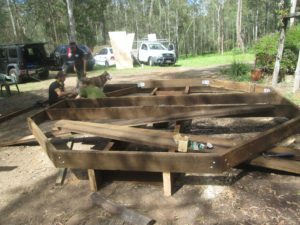 This file includes photos of building the treehouse and building the deck up to April 2018. The shingles were made from a big dead bloodwood tree of from our land in early April. 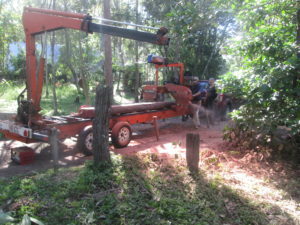 There is a story here: two days before we went to Japan for 16 days on the 4th of April, he got Lance the tree lopper across the road to come and cut down this big dead bloodwood tree near our driveway. Then he hired in a man who cuts big field logs into thin flitches of any thickness. This man arrives with a four wheel drive vehicle …. see the photos below. It took over a week where he and Jase cut and nailed handmade shingles over the whole dome so that the shingles hang down vertically covering the next layer. The shingles were made from a big dead bloodwood tree on our land in early April. There is a story here: two days before we went to Japan for 16 days on the 4th of April, Anthony got Lance the tree lopper across the road to come and cut down this big dead bloodwood tree near our driveway. Then he hired in a man who cuts big field logs into thin flitches of any thickness. This man arrives with a four wheel drive vehicle and a big long trailer. 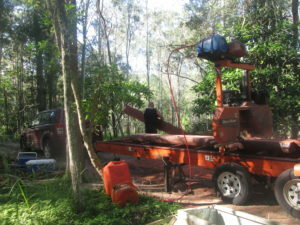 The trailer has a small crane at the end to pick up logs and place them on the trailer for sawing into flitches. The trailer has at the other of the trailer, an adjustable rotating band saw for sawing flitches. 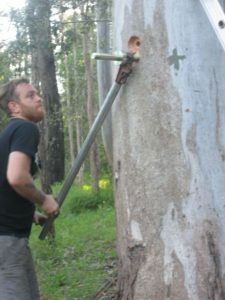 The saw could be adjusted for any thickness for cutting flitches. The rotating band saw is progressively moved by hydraulic action along the trailer and cuts a flitch of measured thickness off the log. A jet of sprayed water on the saw kept it from overheating. This was how Anthony obtained his 10 mm thick handmade shingles. Other shingles were up to 50 mm thick for seats he was going to make as a separate project. He saved many $$ by doing it this way instead of buying them commercially. …. 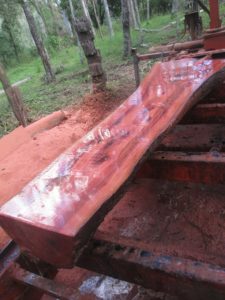 The log when sawn, shows beautiful red timber which is specially apparent with the water from the spraying. 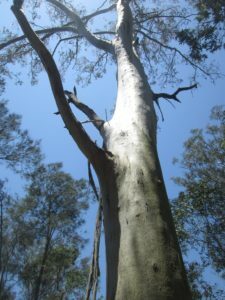 In contrast situations, when settlers came out in the late 1880’s into the dry Australian bush, they wanted to clear the land of trees and create open space for their cattle. They split the trees with wedges to form timber slabs for a hut on their land. They also made post and rail fences: horizontal rails and bigger posts to go in the ground. 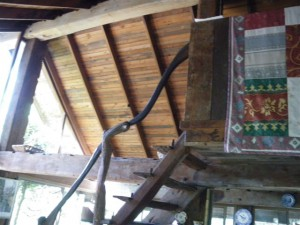 Or they broadaxed the tree into big beams for use in barns or in the city buildings. See the beams used in our house in the photo below. 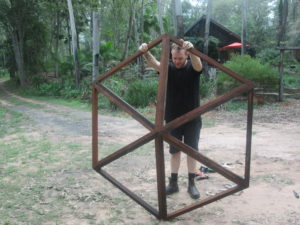 Anthony has yet to build a big mid – deck on posts with a 4.00 metres wide octagonal floor. 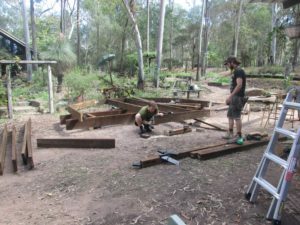 Steps will go from the ground up to the big mid – deck then more steps up to the tree house.